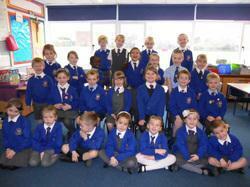 School uniform is available from The School Uniform Shop. Please click on the link below for more details. All children should wear sensible shoes, not trainers or boots. It is big help to us, when trying to reunite children with lost clothes, if all items are marked clearly and permanently with your child's name and in such a way that your child can recognise them as their own. White Tee Shirt, black shorts. Brown, blue or plain dark coloured coats or anoraks or Our Lady’s school fleeces are preferred. It is important that during the summer months pupils have a waterproof jacket with a hood. This may be rolled up and kept in their school bag or PE bag. All children should wear sensible brown, black, navy or grey shoes NOT boots or trainers or fashion shoes. If the child’s anklebone is not visible then the shoes will be classified as boots. In summer, sensible sandals may be worn – brown, black, grey, navy or white. They should not be cloggish or flimsy nor have platform soles or high heels for health and safety reasons. Pupils should have neat hair styles and in their natural colour. Fashion cuts such as steps or shaved patterns are not permitted. Shaved hairstyles should be no shorter than a number 4. Hair gel is not permitted. Long hair should be tied back for health and safety reasons. Hair ribbons and slides must be kept to a minimum. They may only be blue, yellow/gold, white, brown or black. It is safer if children do not wear earrings at all for school. However, if necessary, children with pierced ears may wear gold or silver studs only. They must be flat and plain to a maximum of one in each ear. These are for the purpose of retaining pierced ears and not to be regarded as decorative items. Earrings must not be worn at all for swimming or PE lessons. If your child has just had their ears pierced and cannot, therefore, remove their studs, tape should be used to cover the earrings. This prevents them from being caught or pulled and provides a cushion for the skull. No rings or chains of any sort are allowed. Nail polish is not permitted. Only KS2 children may wear plain watches.